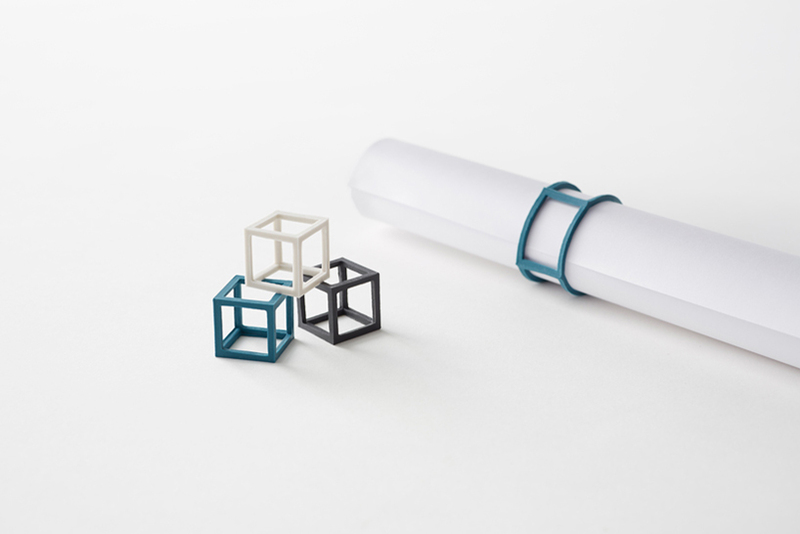 nendo has designed a new stationery collection for their own brand ‘by | n’. 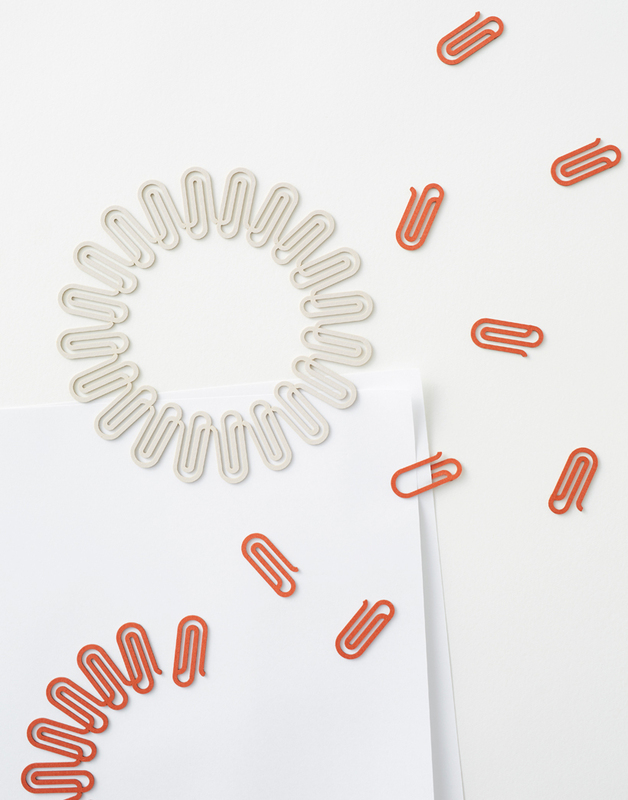 the series of office items includes multipurpose and interchangeable objects, from a three-dimensional, cube shaped rubber band to a detachable paper clip ring. 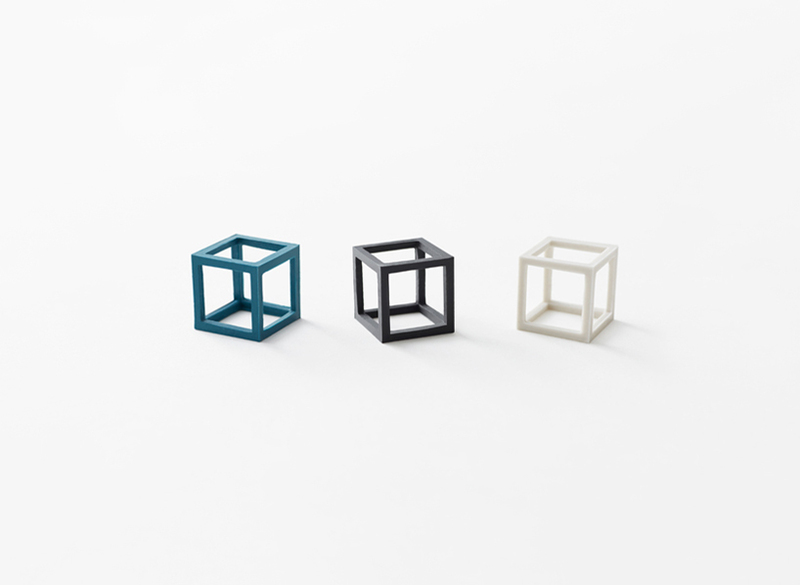 specialized ‘cubic rubber-band’ — available in blue, charcoal, and white — is a free-standing, geometrically shaped elastic that is to locate in a drawer and to pick up. 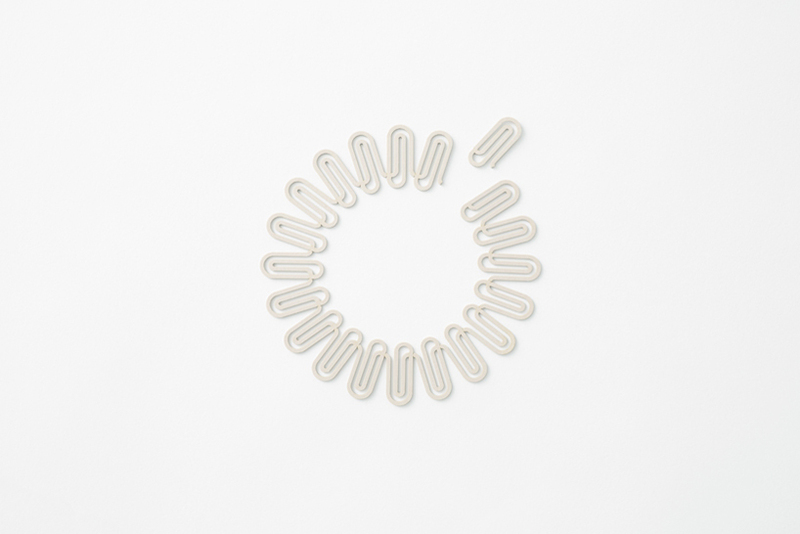 the design of the ‘link clip’ paperclips come connected in a ring shape, and are detached one by one for use, keeping desktops tidy. the fasteners are actually made of paper so that they’re easy to take apart and can be recycled. 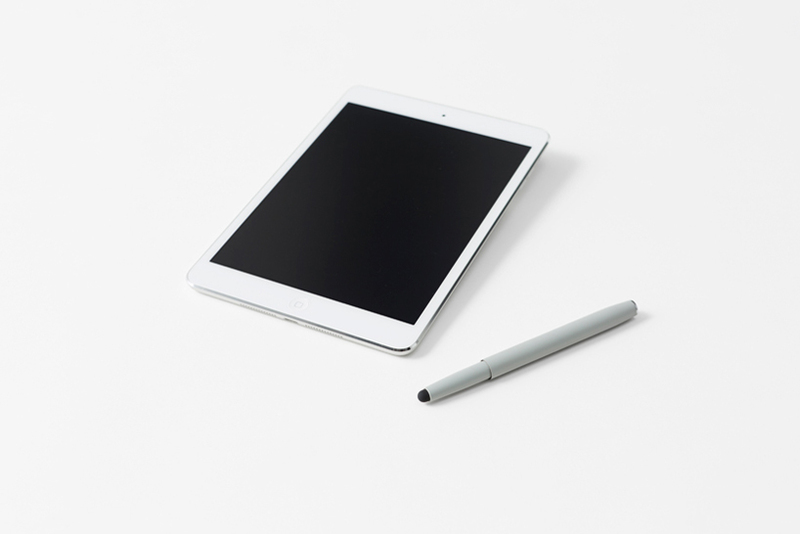 to make up for paper’s material weakness — compared to the traditional metal version — nendo selected a high frictional weight for a stronger grip. the ‘flip pen’ is mostly a cap. reversing it turns the pen into an electronic tablet stylus. the design also comes with a shorter cap as well, for easy portability. 'circle tag' sticky notes come in the shape of pie charts. square and rectangular paper notes can be easily ripped and torn when their corners are caught. increasing the sticky surface area and reducing the number of corners on our sticky notes to the minimum generated a wedge form. the sides of the 'peel pen-case' flip back once it's opened, to make an upright pen holder. the design is for mobile and desk use alike. we don't usually pick up trays full of pens and paperclips and walk around with them, so why do their containers need bottoms? 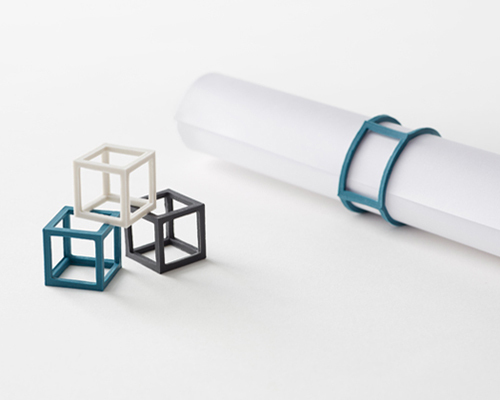 these desktop trays for filing small objects are frames rather than containers. the frame form makes it easier to clean inside and -- when not in use -- the trays can be stacked for storage. flipping back the cover of the 'hard cover memo-pad' creates a stable surface, aiding handheld memo-taking. perforated pages make them easy to detach, while their light grey cross pattern provides a visual surface that's less restrictive than lines but gives more guidance than dots. with mobility in mind, the memo pad comes in two sizes: A5 and 6" smartphone. 'edge note' is missing one corner and has a colorful edge to organize and file. with the spine facing outwards, the notebooks present a neat appearance; reversed, they're easily distinguishable by color. turning them upside down changes the position of the cut-out so that one notebook appears on its own, making it easy to find the volume currently in use. pages are printed in a light cross pattern. the 'dot envelope' is a traditional japanese gift-giving envelope whose bicolor decorative tie pattern is formed entirely from dots. the paper is embossed and treated with ultraviolet ink for a glossy print with a distinctive spatial effect, for a simple, contemporary quality that fully expresses the giver's congratulatory feelings. cylindrical desktop penholders are a dime a dozen, but they don't stabilize each pen and pencil separately. the cross pen-stand holds wide objects like rulers and flat objects like cards and memo paper neatly in place and looks like a repeated cross pattern from above, hence its name. a clear acrylic ruler whose markings fade from white to black, making the ruler easy to use on both dark and light surfaces alike. any information about when/where these will be available?